1. YUTorah on parshat Shemini. 2. That Wascally Wabr -- The meaning of words changes over time and over place. For example, growing up, I was always confused when Torah translations talked about there being corn in Egpyt. Wasn't corn a plant that was native to America? How then could Yaakov have heard that there was corn in Egypt? Either corn existed in Egypt, or this was a strange translation. 2. Did Saadia Gaon have a masorah on shafan al-wabr? As a follow-up and counterpoint to my earlier post about whether Saadia Gaon dreamed that Pishon was the Nile. 3. Haksav vehaKabbalah on the aquatic skink. And how, in the face of evidence that Chazal's rule was not absolute, he was willing to reinterpret it such that it was not meant as absolute. 4. A review of The Enigma of the Biblical Shafan, part one and part two and part three. 6. Did Linneaus classify the hare as a ruminant? The injunction against kohanim drinking wine -- with the connection, according to Bechor Shor, of it being something served to mourners, rather than it being the sin for which Nadav and Avihu were guilty. Why mention that one sign is insufficient? Bechor Shor explains that there is indeed a madreiga in even one sign. The Rambam on Timtum haLev -- Did he really endorse the kabbalistic understanding of timtum halev? How many legs does a מַרְבֵּה רַגְלַיִם have? Rashi in parashas Shemini says it is called centipede, and they call it '100 legs'. But of course centipedes have less than this, so lav davka. Still, could it have 32 legs, as Torah Temimah describes? Shmini sources -- further expanded. For instance, many more meforshei Rashi. YU Torah on parashat Shemini. 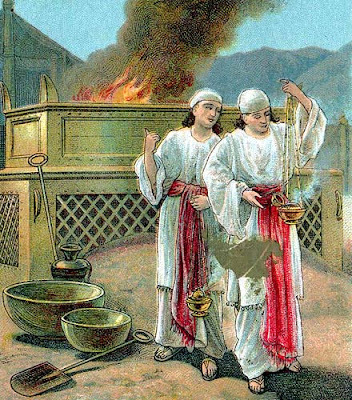 The mercha kfula in parshas Shmini -- How shall we account for it? Aharon's shame and fear -- Understanding the Rashi by considering his sources. The movement of the Shalach -- Targum Yonasan on Re'eh is unduly influenced by the Targum and pasuk in parashat Shemini. Or is it working from a Samaritan text? Shemini sources -- a source roundup. Same idea as last year, but revamped, with over 100 meforshim on the parasha and the haftara, grouped into, e.g. Rashi's supercommentator's, Ibn Ezra's, masoretes, and so on. Ibn Ezra and the transsexual rabbits -- can hares change their gender? An error based on contemporary science. Do Chazal darshen the Samaritan version of Vayikra 20:7? This relates to Shemini -- In parashat Kedoshim, yet another instance in which a derashat Chazal matches the Samaritan text of the Chumash instead of our Masoretic text. In this instance, however, it is somewhat plausible that Chazal are merely darshening the union of two similar pesukim; and that the Samaritans, as is their wont, harmonized the two similar pesukim. Still, after considering Minchas Shai, Gra, a few suggestions of my own, and considering Talmudic variants, I conclude that Chazal were once again darshening a non-Masoretic text. Is the atalef really a bat? Do bats lay eggs? Why the atalef, according to Chazal, was actually a strix. Shemini sources: links by aliyah and perek to an online mikraos gedolos, as well as many, many meforshim on the parsha and haftara. Why the Ketores? And what foreign fire? The standard morning ketores offering, according to Rashbam. But then Shadal reverses himself and says it was their own separate offering; and that it was not their own fire, but a fire from heaven. "This is that which the LORD has spoken" But where? Another take on Nadav and Avihu's sin, from the gemara. This is a truly sublime midrash, once its nuances are pointed out. The specifics of the law they are rendering (that one should bring from a hedyot fire even though the Divine fire is present) parallels their error, rendering a halacha even though Moshe Rabbenu was present. This homily, I think, is part of the main meaning of the midrash. Also, an analysis of some of the midrash's contributing factors. I suggest it was a work accident. They brought a "strange fire," but this might just be meant to distinguish it from the holy fire that consumed them. As we see in context, the fire of Hashem came down and consumed the sacrifices, the people saw and fell on their faces. I try to pull a midrash into this as well. Nadav and Avihu - What Did They Do Wrong? A parallel to Korach and his congregation. Perhaps their sin was acting in an instance where only Aharon was supposed to act. Also, explaining the dispute between Aharon and Moshe. This joke just doesn't work in a leap year, at least in its particular form. Oh well. Noteret and Notarim are used to describe both of them. The remaining sons should take the remaining of the offering. How can we explain Hevel's sacrifice?